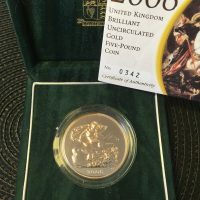 2005 Royal mint gold five pound coin, housed in Royal mint case of issue with certificate, brilliant unc. 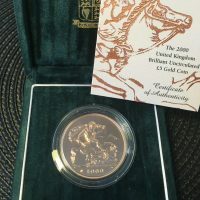 2000 Royal mint gold five pound coin, housed in Royal mint case of issue with certificate, brilliant unc. 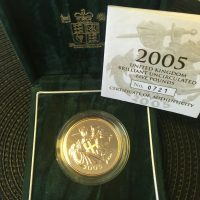 2006 Royal mint gold five pound coin, housed in Royal mint case of issue with certificate, brilliant unc. 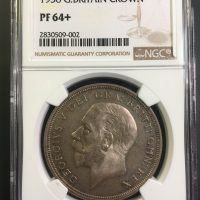 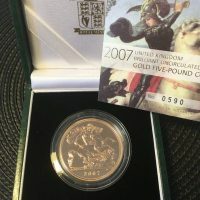 2007 Royal mint gold five pound coin, housed in Royal mint case of issue with certificate, brilliant unc. 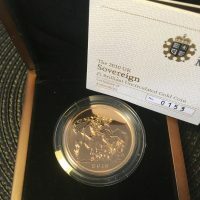 2010 Royal mint gold five pound coin, housed in Royal mint case of issue with certificate, brilliant unc. 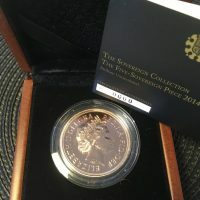 2014 Royal mint gold five pound coin, housed in Royal mint case of issue with certificate, brilliant unc. 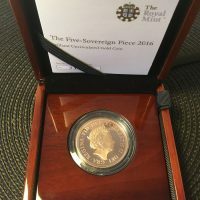 2016 Royal mint gold five pound coin, housed in Royal mint case of issue with certificate, brilliant unc. 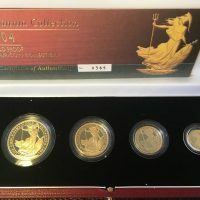 2004 Royal mint gold five coin Proof set (£100, £50, £25, £10), housed in Royal mint case of issue with certificate. 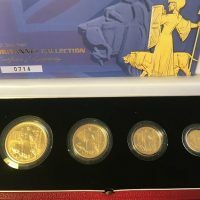 2001 Royal mint gold five coin Proof set (£100, £50, £25, £10), housed in Royal mint case of issue with certificate.